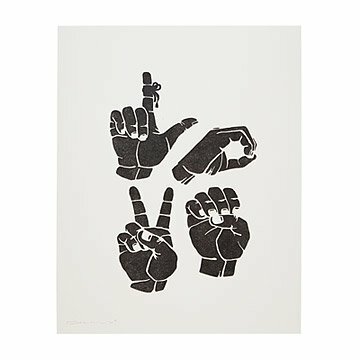 This photocopy transfer by Gregory Beauchamp renders "love" in sign language. The language of love may be universal, but American Sign Language expresses it through a series of heartfelt gestures. This print by Gregory Beauchamp renders the signs for L-O-V-E through photocopy transfer: An image is layered face down on the printmaking paper, and then a citrus solvent and patient hand-burnishing transfers the copy to the final print. More impressionistic than a screenprint, this method celebrates the subtle variations characteristic of a hand-printed image. Handmade in California.